Jan. 25- Summer Study Abroad Fair! 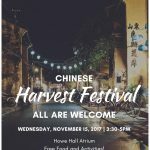 Please Join Engineering International Programs at the Chinese Harvest Festival: Wednesday, November 15, 2017 3:30-5pm in the Howe Hall Atrium There will be free food and activities! You can also learn about opportunities to Study Abroad in China.